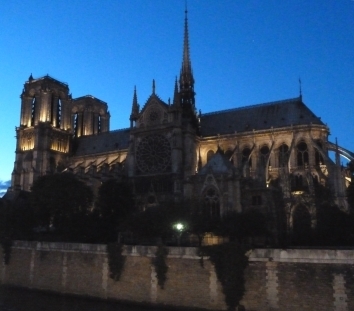 Two views below of Notre Dame de Paris at night in 2012. We are very sorry to see the effects of today's fire. You can read your own poem, or a favourite by someone else. You can share a translation of your piecein English, or just give a brief outline or introduction. All styles of poetry are welcome – from traditional forms to contemporary spoken word and rap. Open mic spots are 4 minutes long, including any introduction or translation. Email mothertonguemic@gmail.com to sign up in advance. provide you with latest information on program plans for 2019. There was an outage with web hosting on our two domains, https://cal.act.edu.au and https://languages.org.au, from early hours of Saturday morning (possibly around 6 am AEST) to about midday today, because of an error in the transitional arrangements with a new billing system at the web hosting company. Apologies to any of you who attempted to read our updates during that time. In responding to my complaint about the outage and their extraordinary billing error, the web hosting company's representative apologised, assured us that it will not happen again and allocated an additional month of web hosting without charge. Given that we were already paid up for web hosting until the end of March 2020 (!! ), that extends it to the end of April next year. The Canberra Liberals' endorsement of the pathways concept for language learning in schools (not a new idea, but perhaps an extension of the current one), announced by Elizabeth Lee today, needs effective teacher supply, recruitment and retention provisions to make it work. However, there also needs to be effective central provision supported by ACT government for language learning so that families who move between districts or who have a particular language connection can access the language learning that is relevant to them. It’s available in most jurisdictions except ACT. We wrote to ACT Government about this in December 2017 and CAL will lodge a follow-up submission this year. Quite a lot happening in the language space! See below for an overview of upcoming events plus other language related news. Languages afternoon tea: free networking event for lovers of languages and language learning, Sunday 7 April, Red Hill. Interested in establishing a German language immersion program in Canberra? Copies of previous Forum Updates are available at https://canberralanguages.blogspot.com/p/forum-updates.html. Dr Mandy Scott, Canberra Region Languages Forum Convenor. Over recent weeks a number of draft BSSS courses developed during 2018, including those written under the Modern Languages Framework, have been available for public consultation. You are invited to examine these courses and provide feedback. The consultation period has been extended until 22 March. All feedback during the consultation period will be collected and analysed by the OBSSS and course developers to guide the revision of the draft courses before they are accredited for delivery in 2020. The draft modern languages courses are available for viewing on the BSSS website. For each course there is an online questionnaire. Feedback, including ratings and detailed comments on key elements of the paper, can be provided directly via the online questionnaire. CAL French class visited Palace Electric Cinema in New Acton on Friday evening 15 MArch to see Au Bout des Doigts (advertised as "In Your Hands" in English, but we think better translated as "At Your Fingertips") as part of the Alliance Française French Film Festival. An excellent choice for Year 11-12 students of French. The Canberra Academy of Languages has several expressions of interest for Year 11-12 Continuing and Advanced German in 2019. Subject to viable numbers for a class to run, CAL will need a qualified teacher for German. The class may still commence in 2019 if suitable catch-up arrangements can be negotiated. Alternatively, current Year 11 students who have expressed interest may undertake German as a minor in 2020 alongside the next Year 11 intake. The salary scale would be based on the federal Educational Services (Teachers) Award afternoon shift quarter day rate, one shift for the on-site session and one shift for the off-site program per week. If interested, please contact CAL. ICT capabilities including the ability to identify suitable authentic source documents in the target language and to curate online learning resources for access by students. The Mother Language Walk 2019 will take place on Sunday 24 February 2019. The walk will start at 10:30 am, at the International Flag Display near Questacon carpark and will finish at Kings Park, near the Police Memorial. Follow-up news: The first photo below is from the ceremony for the International Mother Language Day Language Walk, held at the International Flag Display at Commonwealth Place on the shoreline of Lake Burley Griffin. The ceremony was conducted with International Mother Language Movement Canberra Convener Zahi Hoque as MC, welcome by Caroline Hughes, Director of Indigenous Education at CIT, followed by ACT Minister for Multicultural Affairs Chris Steel, ACT Opposition Leader Alistair Coe, Head of the UN Information Centre Christopher Woodthorpe, High Commissioner for Bangladesh to Australia His Excellency Mohammad Sufiur Rahman Indigenous, and Jay Daley, who conducted the Indigenous smoking ceremony. The ceremony was followed by a walk via Kings Avenue Bridge with songs from around the world performed by the Lyneham High singers accompanied by Thomas Laue at the National Carillon and a sausage sizzle in Kings Park. On Sunday 17 February, the Canberra Academy of Languages, ACT Bilingual Education Alliance and Canberra Region Languages Forum will be some of the organisations represented on the Multilingual Canberra Stall at National Multicultural Festival (NMF). Find us from 11 am to 3 pm on Stall G33, in Civic Square. There will also be other languages-related stalls nearby on Sunday, as well as other languages-related activities on the weekend of the NMF, such as the Languages Showcase on Stage 2 with multilingual poets and singers, 2pm–5pm (Saturday) and the "Say G'day" competition on Saturday-Sunday. For more information, see the ACT Bilingual Education Alliance events page. Postscript: Photos below are from the Multilingual Canberra stall in Civic Square on Sunday 17 February at the National Multicultural Festival. Excellent responses to the greetings in multiple languages competition - more than 100. Great to see Azra Khan, festival organiser, who visted the stall. Thanks to all the ACT BEA members who helped at the stall with enquiries from stall visitors. If learning or improving a language was one of your new year resolutions, now is the time to enrol for a course. Exciting language related activities also coming up this month and in February, especially at the Multicultural Festival (NMF). See below for an overview of items and the attached for more details. You will see that the Forum has a new logo! Many thanks to Taiwanese artist, Wen-Ying Shiao, for this. The Update can be accessed electronically here. Best wishes to you all for the summer break and the new year. In 2019, we will continue to run programs for Continuing and Advanced French, delivering the units "The World Around Us" and "Lifestyle and Traditions". Students in either Year 11 or Year 12 may participate, provided the units do not duplicate the ones they have already completed. At this stage, there are not enough expressions of interest for German or Indonesian, but we may review this in January if the situation changes. Enrolment information is available from our home page. Information about program content for French is available the French home page on our resources website. 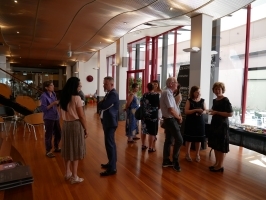 Our thanks to the Alliance Française de Canberra – venue with great ambiance for our end of year event and to our guest speaker, Flavie Coulbault, Chargée de coopération éducative et linguistique, Ambassade de France en Australie. Congratulations to all five students who did this year's program with us, particularly Liz, our Year 12 graduate, who was also successful in qualifying for the DELF B2 diploma. Thanks to Liz and Grace for their excellent addresses, delivered with confidence in French and English. 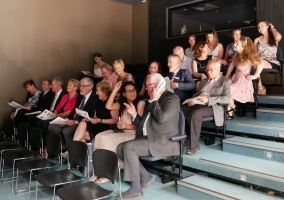 It was excellent to see current and former principals, deputy principals, languages coordinators, French teachers, advisory panel members, reference group members, former president of the ACT Community Language Schools Association, colleagues at the Alliance Française, and students of the Canberra Academy of Languages. Copies of the Convener's report for 2018 were available at the event. The CAL End of Year Ceremony for 2018 will be held on Tuesday 18 December from 2:30 pm at the Alliance Française, 66 McCaughey Street, Turner 2612. If you would like to attend, please email info@cal.act.edu.au and let us know your name, preferred phone contact details and the number of people wishing to attend with you. 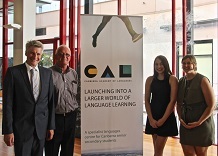 We have received confirmation from the Alliance Française de Canberra that the Convener of the Canberra Academy of Languages, Frank Keighley, has been awarded the DALF C2 (Niveau C2 du Cadre européen commun de référence pour les langues (CECR) – Level C2 of the Common European Framework of Reference for Languages). This qualification is awarded by the Centre International d'Études Pédagogiques (CIEP), an agency of the French Education Ministry. It forms part of the scale of recognition of language proficiency that comprises the Diplôme d’Études en Langue Française (DELF A1, A2, B1, B2) and the Diplôme Approfondi de Langue Française (DALF C1, C2). The DELF B1 is the level required for applications for French citizenship and the DELF B2 is required for applications for undergraduate studies at French universities. DALF C1 is required by some universities for non-French candidates to apply for post-graduate studies. As described on the DELF/DALF website, "Le C2 est le niveau le plus élevé du CECR et le DALF C2 est le plus haut diplôme de français langue étrangère. Au niveau C2, la maîtrise de la langue se traduit par un degré de précision, d'adéquation et d'aisance dans l'expression. Le candidat de C2 est capable de réaliser des tâches académiques ou de niveau avancé." Thanks to Joan Dunn and Stephen Leek, President and Artistic Director of the Young Music Society, for the opportunity to meet with them today at their (relatively) new premises in the Flynn Community Hub. As another (albeit they are much larger scale) non-profit, we found much in common on which to compare notes. They are doing great work, including preparations for their Summer Music School, at which they anticipate having more than 400 participants from 7 to 18 January 2019. Pictured below: educators from Guangdong Province, with Principal of the Australian Contempory Chinese Dr Fuxin Li and Convener of the Canberra Academy of Languages Frank Keighley in the Multifunction Room at the Theo Notaras Multicultural Centre on their four-day visit to Canberra as part of an Australian tour for the group. This morning, they participated in workshop sessions with Frank Keighley on professional standards and professional learning; and on teaching methodology, including curriculum, pedagogy, assessment and student wellbeing. This afternoon, they were with Dr Mandy Scott, Convener of the Canberra Region Languages Forum, for a workshop session on Australian school education systems. On Thursday afternoon, they will visit Hawker College for a guided tour of the college, as guests of the Principal, Andy Mison. 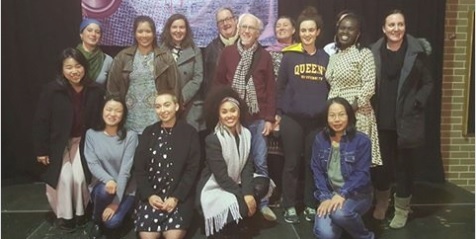 This year, CAL became the auspicing organisation for the editors of be:longing, an online magazine exploring personal experiences of migration, cross-culture, nostalgia and belonging, to apply for funding under the 2018-19 ACT Participation (Multicultural) Grants Program for ongoing publication associated with a live event to be held in May 2019. Meanwhile, on 1 December 2018, be:longing hosted an event at Smiths Alternative titled "Talking Migration and Nostalgia". If you want to learn a language, how available is it in the ACT? Has the ACT dropped the ball on this? Scope of employment opportunities related to languages skills and the range of languages spoken in Canberra households. Constraints on schools in provision of languages programs, considerations of staffing budgets. Opportunity to make more diverse provision for languages learning by supplementing school-based programs with centrally-delivered programs, as happens in other jurisdictions. Integration of teacher education and higher education in languages as an area that needs attention in the ACT. Teacher supply affected by the difficulty schools face in creating full-time teaching positions that prioritise expertise in languages. Language rights: the need for access to high-quality programs in languages of choice for students, which can be improved by combining strong school-based languages programs, together with a strong government-backed central after-hours delivery strategy for languages. What we stand to gain: system leadership can provide the opportunity for students to develop languages skills to a high level that can be applied in practical ways in the community and in workplaces. 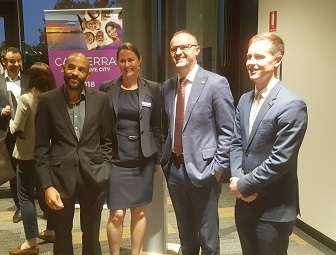 At the launch of the ACT Multicultural Summit on Thursday evening, one of the speakers was Andrew Barr, ACT Chief Minister. 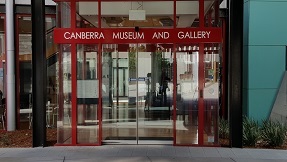 Among other points, Andrew Barr said that Canberra is uniquely placed to be an exemplary internationally-focussed community and to model inclusivity. 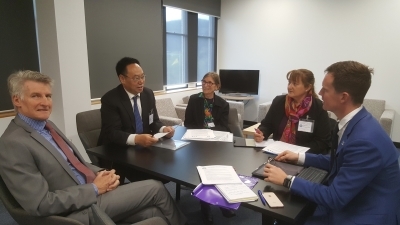 Dr Mandy Scott, Convener of the Canberra Region Languages Forum and Frank Keighley, Convener of the Canberra Academy of Languages had a good & positive conversation with Chief Minister Andrew Barr about future of languages education for the ACT. Pictured below: Deputy Chair and Chair of Multicultural Advisory Council; Chief Minister Andrew Barr; Minister for Multicultural Affairs Chris Steel. Languages received a high profile in reporting back at the end of the summit. We look forward to reading the draft report of the summit, which we understand will be circulated to participants in the near future. 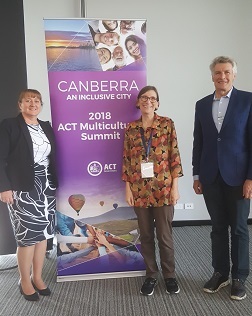 Pictured below: Veronique Canellas, President of the Modern Languages Teachers' Association of the ACT; Dr Mandy Scott, Convener of the Canberra Region Languages Forum; and Frank Keighley, Convener of the Canberra Academy of Languages. A position statement on "Languages as a resource for all" was endorsed on 20 November by ACT Bilingual Education Alliance, Languages Forum of the ACT and the Canberra Academy of Languages. The statement will be tabled at the next meeting of the Canberra Languages Network, to be held on Thursday 22 November 2018. 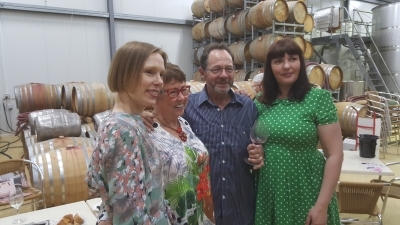 Launch of the October 2018 edition of Canberra en français magazine on 26 October at Mount Majura Vineyard - Nancy Waites and Flavie Alvarez with two of the guests, from Parkes NSW. In this edition, there are items written by two of our CAL French students. Three others had items published in the June edition. Meeting with the ACT Minister for Multicultural Affairs Chris Steel – discussion on language resources in the ACT on 10 October, with Convener of Canberra Academy of Languages, President of the Community Language Schools Association of the ACT, President of the Modern Language Teachers' Association, Convener of the Languages Forum of the ACT. 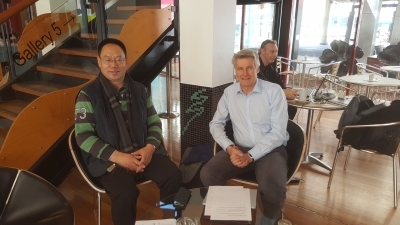 Conferring on 8 October at CMAG Café with Fuxin Li, now president of Community Language Schools Association. We will hold an information evening from 6 pm on Thursday 20 September at the Ainslie Arts Centre, 30 Elouera Street, Braddon (corner of Donaldson Street, on the CBD side from Ainslie Primary School). Elouera Street is the continuation of Doonkuna Street and the Ainslie Arts Centre appears on Google maps as being on Doonkuna Street, but navigation using 30 Elouera Street should work correctly. We will provide students and their families with advice on learning languages in Years 11-12, receiving credit for your languages studies towards the ACT Senior Secondary Certificate and towards the ATAR, and programs offered in Continuing and Advanced French, German and Indonesian. On Wednesday 12 September, Dr Mandy Scott and I met with Azra Khan, Senior Manager in the Community Services Directorate, who coordinates the National Multicultural Festival. We put several suggestions, one of which related to the inclusion of references to languages in publicity for the festival. It is excellent to see that, as of December, languages are included on the festival home page, so that they are reflected in online messaging as an important dimension of multiculturalism. 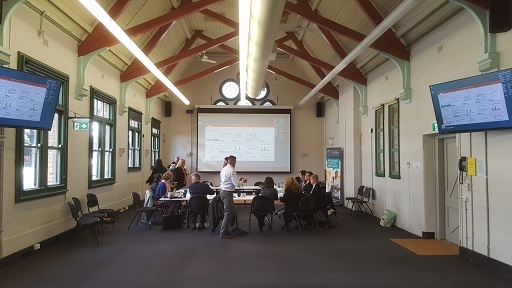 The ANGLS Conference was hosted from 23 to 25 August 2018 at the new headquarters of the NSW School of Languages in Petersham with colleagues participating this year from languages centres in SA, Victoria and NSW. The 2018 ANGLS Conference was the 21st conference of the Australian Network of Government Languages Schools. The conference was illuminating and valuable. The historic (100 years +) building in Petersham is newly converted and refurbished. There will be a great lineup of poets signed up for the Multilingual Poetry Night on Monday 13 August 2018 from 7 pm to 9 pm at Smith's Alternative, in languages including Mandarin, Cebuano, Hindi, Bengali, French, German, Shona, Dari, Farsi, Japanese, Mongolian, Sinhalese, Serbian and Spanish Each poet will share some insight into their poem, or a full translation, in English. Presented in partnership with That Poetry Thing, which is on at Smith's every Monday Night, the event is $5 at the door, but free for poets and readers who sign up before the night. Thanks again to Jacqui Malins, co-founder of Mother Tongue Multilingual Poetry, for organising this event. Spend an afternoon participating at Civic Library on Sunday 5 August exploring writing and performing poetry in languages other than English - or a mix of languages - in this free workshop to be held from 2 pm to 5 pm. It might be your first language or Mother Tongue, or you might be a language learner. But if you are interested in expressing yourself poetically, come for an afternoon of writing activities with a multilingual focus, and performance exercises to build your confidence and expression. Multilingual poets Vesna Cvjeticanin and Karina Bontes-Forward, along with Jacqui Malins, will lead exercises to get the words flowing from your pen and your lips. Suitable for those who want to try writing poetry for the first time, or poets who want to be stimulated and inspired. It is also a great opportunity to meet other writers who are interested in the power of words beyond the English language. Vesna is a Serbian-born poet and devoted lover and explorer of the Serbian language. She writes in her mother tongue and translates her work to English. Vesna has increasingly been enjoying the freedom poetry gives her in conveying her thoughts to a range of audiences. Karina Bontes-Forward is a poet and musician of Chilean heritage who writes and sings in Spanish, Indonesian and English and enjoys playing with different musical traditions and languages. Email Mothertongue Multilingual Poetry to RSVP, and please email or call Jacqui on 0433 845900 if you have any questions. Excellent "soirée littéraire" yesterday evening Thursday 21 June, with author Karen Viggers reading extracts from her writings and Flavie Alvarez reading French translations. Great to listen to. Nancy Waites launched the second edition of the magazine Canberra en français - a beautiful local publication. Three CAL French students had items included at page 13 of this edition, under the title “témoignages”, alongside an item about the Canberra Academy of Languages. The other two items were held over for the October edition, for reasons of available space. The venue for CAL Open Night has been confirmed. The event will commence at 6 pm on Thursday 14 June 2018 and will be held at the Ainslie Arts Centre, Elouera Street, Braddon. We will outline our purpose, programs and enrolment process. Senior secondary (Years 11-12) Continuing and Advanced courses will be offered for 2019 in French, German and Indonesian, subject to viable numbers to fund teacher recruitment for these programs. Additional courses may also be delivered, subject to negotiations with colleges. To assist with catering numbers, please rsvp via EventBrite. Pasi Sahlberg advocates a 24th Gonski 2.0 clause for right to learn a language: article in SMH and Canberra Times on Sunday 3 June 2018. This view accords with the CAL Charter, which includes a statement that "equity in language learning requires that the option to continue learning a language as part of a senior secondary education program should be available to students throughout the educational jurisdiction". Students who don't have access to learning languages are not only missing out on the enrichment of languages and the cultures to which they are a key; they are also missing out on learning about grammar and language as a system. Sahlberg's comments were supported by Professor Ken Cruickshank, director of the Sydney Institute for Community Language Education. Highly successful Multilingual Poetry Showcase on Saturday afternoon including poetry in Acholi and English by Jackline Okot. Pictured: Saturday's performers. 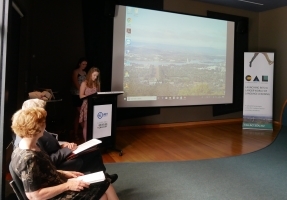 The updated Articles of Association, including the Charter at Schedule 2 of the articles, were endorsed at the Special General Meeting of the Canberra Academy of Languages on Monday 14 May 2018. Excellence in language learning requires scope for continuity. In the interests of continuity, it is imperative that students should have access to continued learning in their chosen languages as part of their senior secondary education. Equity in language learning requires that the option to continue learning a language as part of a senior secondary education program should be available to students throughout the educational jurisdiction. A civil society gives recognition and active support to linguistic and cultural diversity and recognises the importance of language rights, including the right of learners to aspire to, or to maintain and develop, bilingual or multilingual capabilities. The German Film Festival has begun. It will run from 23 May to 6 June at Palace Electric Cinema at the Nishi Building in New Acton. 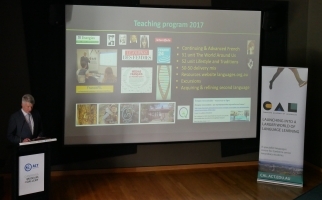 The Canberra Academy of Languages is a sponsor, with a slide in the ad reel during the festival, featuring our open night. CAL Convener Frank Keighley visited the Alliance Française de Melbourne on 3-5 April 2018 for the program for DELF examiners. DELF(Diplôme d'Études de Langue Française) diplomas are based on the Common European Framework of Reference for Languages. CAL French students are invited to do the DELF exams in the final term of Year 12 for an additional, internationally-recognised, credential as evidence of their language proficiency. We are planning an update to the Articles of Association for the Canberra Academy of Languages, in particular Schedule 2, the charter of the organisation, outlining our values (which are listed on the home page of our website) and their significance in the context of language learning for our students. Your thoughts are welcome on the proposed charter update. CAL will be represented at the ACT Government's Connect and Participate Expo (CAP Expo) at the Kingston Bus Depot Markets on 24 March 2018 (21 Wentworth Avenue, Kingston), 11 am to 3 pm. This will be the fifth year of CAP Expo, which ran for the first time in 2014. The ACT Bilingual Education Alliance (ACT BEA) stall, with a focus on learning languages in the ACT, will have information from ACT BEA, CAL and other organisations that are active in the field. The French Film Festival was held from 1 to 28 March at Palace Electric Cinema at the Nishi Building in New Acton. Highlights included the screening of C'est la vie (released in 2017) on the opening night, directed by Eric Toledano and Olivier Nakache (also directors of Les Intouchables, 2011); La Mélodie (Orchestra Class), 2017, directed by Rachid Hami; Au revoir là-haut (See you up there), 2017, directed by Albert Dupontel; Demain tout commence (Two is a Family), 2016, directed by Hugo Gélin; Knock (Dr Knock), 2017, directed by Lorraine Lévy; and Jeune Femme (Montparnasse Bienvenue), 2017, directed by Léonor Serraille. We are pleased to confirm our venue, the Alliance Française, 66 McCaughey Street, Turner, for CAL French in 2018. Benefits in our new venue include an authentic French ambiance, wifi accessible for students to access our CAL online resources repository (languages.org.au), AF resource centre in the same building, on-site café facility and ready access to latest information on French community events. We commenced our 2018 CAL French programs at Alliance Française, 66 McCaughey Street, Turner, on Wednesday 14 February 2018. Thanks to our AFCanberra colleagues for facilitating this. It was very good to meet with students and families for our 2018 programs yesterday evening. We look forward to an excellent year. 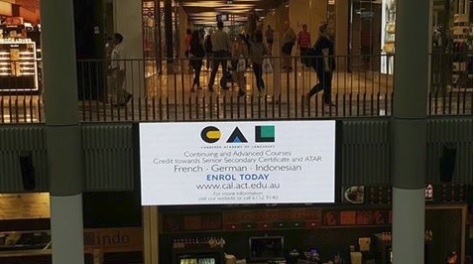 For anyone who missed the evening and is interested in finding out more about the program, please send a note to info@cal.act.edu.au, or call us on (02) 6152 9140. It's the first day of the 2018 school year in the ACT and aspiring senior secondary languages students have three days left to enrol for French with Canberra Academy of Languages. CAL classes start in Week 2. Prospective students should enrol with us by COB Wednesday 7 February. Students and their families are invited to attend our registration session at Civic Library on Wednesday evening from 6 pm for an introduction to the 2018 program. Canberra Academy of Languages is now enrolling for 2018 – follow this link. See below for pictures and our 2017 report from the CAL End of Year Ceremony held on 12 December at CMAG. Final date for 2018 enrolments is Wednesday 7 February 2018. Earlier enrolment is preferred. 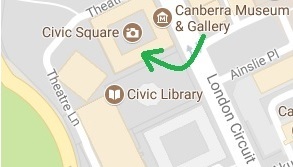 Registration evening will be held in the Mezzanine at Civic Library (adjacent to the Canberra Theatre Centre) from 6 pm on Thursday 8 February [this event was subsequently moved to 7 February]. Thanks to all our guests for today's CAL ceremony at CMAG. Congratulations to our fine students, Hayley and Bernie in the Class of 2017 - the foundation class of the Canberra Academy of Languages. The convener's report for 2017 available here. See pictures from the ceremony here and on our Facebook page. The Canberra Academy of Languages has sent a submission to ACT Government on the Future of Education. In accord with our purpose as an organisation, the focus of our submission is on provisions in the ACT for senior secondary languages. The ACT's senior secondary system is an outstanding asset for our educational jurisdiction, but as the national capital, seat of the Federal Government and base for Australia’s foreign relations, the ACT should be achieving much better outcomes in completion of language studies by students to Year 12 level. Our submission sets out what ACT Government needs to do about strengthening provision for language learning and creating better access for students who have invested in that learning prior to commencing in Years 11-12. The CAL French class visited the Alliance Française yesterday morning to find out about programs and resources (including Culturethèque, the online French library). The visit was an opportunity to find out about ways to maintain connections with French language and culture into the future. We met with courses coordinator Graziella Vergain, director Patrice Gilles and deputy director Anaïs Garrigues. We have a notice about enrolments running in the food courts at the Canberra Centre from 13 to 26 November. Our CAL stall was in good hands at the Community Languages Day at EPIC (Exhibition Park in Canberra) on Saturday 21 November 2017. This session was about performing arts in France – theatre, dance and music – a topic in the accredited French program for the current semester. Select this link to download an mp4 with an extract from the lesson, where we were discussing how theatre tickets in the national theatres in France are subsidised and the balance is paid by theatre-goers. Our information evening was held on Thursday 14 September 2017 from 6 pm at the Canberra Museum and Gallery (CMAG) for prospective 2018 students and their families and schools. We thank all those who attended. If you would like information but were unable to attend, please contact us. On Wednesday 13 September 2017, we launched the Canberra Academy of Languages Facebook page. A link to our Facebook page from the Contacts section of the home page on our website was added on 21 September. We look forward to participating in this interactive medium in communicating with you about our programs. 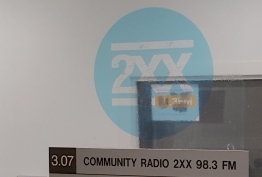 At midday on Monday 11 September 2017 at Community radio 2XXfm, Victor Marillanca on his show Multicultural Voices of ACT kindly hosted an interview with Frank Keighley, for a discussion about the Canberra Academy of Languages and our plans for 2018. Select this link to download an mp3 with extracts from the interview. Our announcement for our September information evening is now up on the digital display outside the Canberra Convention Centre. 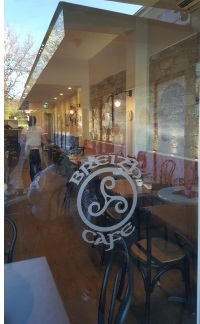 The CAL class met with students from southside for a fine Breton-style French lunch and conversation in French at Café Breizh in Ainslie on Thursday 31 August 2017. At its meeting on 17 August 2017 the ACT Board of Secondary Studies approved full registration of the Canberra Academy of Languages as a Specialist Education Provider for the period to 31 December 2022. We participated in the 2017 ANGLS Conference at Open Access College in Adelaide on Monday-Tuesday, 14-15 August 2017. This gathering of coordinators of specialist languages schools from five of the eight Australian education jurisdictions was a valuable opportunity to exchange experience and insights about languages education in Australia. 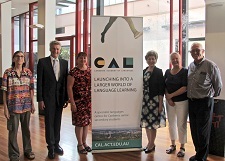 The 2017 AFMLTA Conference, from 6-8 July 2017 at Bond University, was an opportunity to present the concept and plans of the Canberra Academy of Languages and to meet with colleagues who specialise in delivering programs for language learning throughout Australia. We are pleased to announce an agreement on collaboration with the Alliance Française de Canberra. I met on 12 May 2017 with the Director, Patrice Gilles and the Business Development Manager, Vincent Brousse, to sign the agreement. 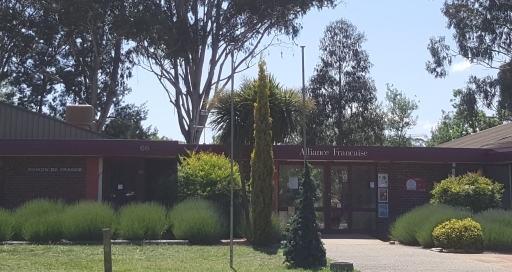 We have complementary roles in providing opportunities for learners of French in the Canberra region, with the Canberra Academy of Languages offering courses for credit towards the ACT Senior Secondary Certificate and the Alliance Française offering conversation classes, cultural events and DELF certification. The CAL French class visited Palace Electric Cinema in Acton to see the film Un Sac de Billes (director Christian Duguay), during the Alliance Française French Film Festival, on Wednesday 22 March 2017. A valuable kit pédagogique was made available by the Alliance Française for use in classes in relation to the film. The CAL French class attended the National Gallery of Australia to view the exhibition Versailles – Treasures from the Palace. In a collaboration by the NGA with the Modern Language Teachers' Association of the ACT, a set of educational resources was prepared in 2016 for use by classes in relation to the exhibition, including resources tailored for senior secondary French, based on the themes in ACT French courses accredited with BSSS. Programs for 2017 commenced in Week 2 of Term 1, to enable schools and colleges to finalise timetables and class placements in Week 1. In 2017, we are delivering programs in French, commencing with the two units The World Around Us (Semester 1) and Lifestyle and Traditions (Semester 2) from the ACT BSSS Type 1 Continuing French and Advanced French courses. 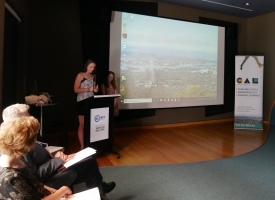 Our launch was held at the Canberra Museum and Gallery (CMAG) on Tuesday 17 January 2017, with 51 attending. Thanks to all who were there for the event, to CMAG for providing an excellent venue (pictured below left), to our advisory panel and patron (centre photo) and to our speakers (below on right). 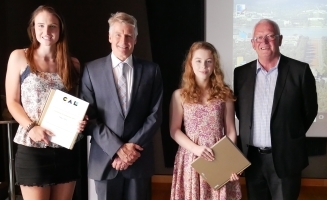 Included in the program was an address by Heather Macpherson and one by Emily Fisher, former students of French from Hawker College, and Emily Fisher. Their reflections from a learner's perspective gave us valuable insights on the diverse reasons for learning languages. 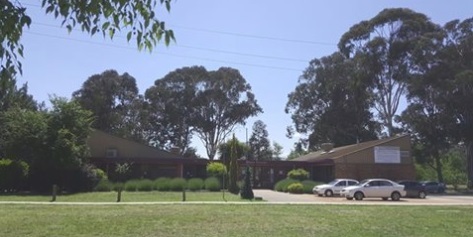 An information evening, as listed on the Events page of this website, will be held at Dickson College on Wednesday 14 December 2016, from 5 pm to 6 pm, for interested schools and also for families of students considering studies in a language in addition to a full load in their day schools. At its meeting on 8 December 2016, the ACT Board of Senior Secondary Studies approved the provisional registration of the Canberra Academy of Languages for the period 1 January 2017 to 31 August 2017. 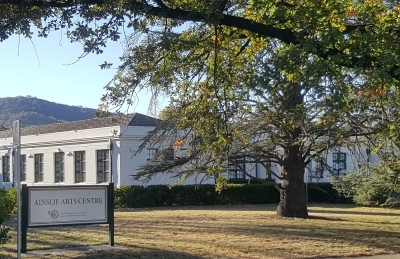 The Canberra Academy of Languages became an incorporated organisation with Access Canberra on 15 September 2016. Our visit to the South Australian School of Languages was an outstanding opportunity to talk with the Principal, Lia Tedesco, about their philosophy and operations as a centre giving opportunities to almost 2000 students to learn the languages of their choice in Adelaide.